The stat chunk may be used to prominently display an important or meaningful statistic. Reference the Web Style Guide for more information about the stat chunk. On a page, there must be more than one stat chunk, and the chunks must be arranged in a grid. Top 10The stat chunk has been named one of the top content chunks by IU. 1 IN 2Students like pizza. The Stat Number field is a text-only field. This number is associated with the statistic and shown in larger text than the rest of the content. Content is the text associated with the statistic. To provide more information about a stat, a link may be added in the stat chunk. 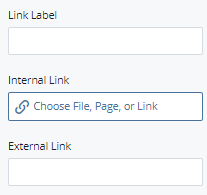 Link Label is a text-only field that will display as a button. Either an internal or external link may be added. Expand to Section > Chunk. Choose Stat as the chunk type. Expand Section > Chunk > Details. 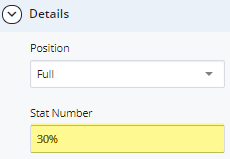 Enter the statistic number in the Stat Number field. Since we have chosen to arrange the stats in a grid, you do not need to change the Size or Position fields. 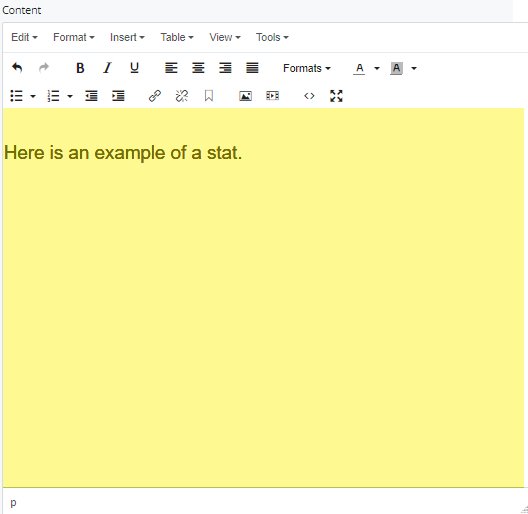 Enter text for the statistic in the Content field. If a link button is needed at the end of the statistic, type the display name (Link Label) and add an Internal or External link. If additional stat chunks are needed, click the [+] to add chunks.